Gullah Joe, born Joseph Blake, Jr., is a native of Charleston, SC, and grew up in the authentic Gullah community of Red Top, SC. His early education included the history and traditions of Gullah culture, which were mostly taught by the elderly members of his family and community. After traveling with the United States Navy and experiencing other cultures, he realized the need to share his knowledge of Gullah/Geechee culture and traditions. This calling has become his passion, so he set out to “EDU-TAIN” as an expert and licensed tour guide of Gullah culture, emphasizing African, African-American, and Gullah/Geechee cultural accomplishments. 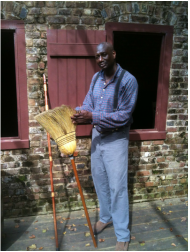 As a Gullah Interpreter and tour guide in Charleston, SC, he guides and EDU-TAINS national and international tourists through the journey of Africans that landed in the Charleston area. These Africans were the foundation of what is known as the Gullah/Geechee people. Gullah Joe brings to life the unique artwork, language, food, work, family lifestyle of worship, and struggles of the Gullah people. Gullah Joe is also one of the Gullah History Interpreters at “da Gullah Theater” at Boone Hall Plantation in Mount Pleasant, SC.